Some guy had time enough on his hands to create the worlds largest maze for a browser based pacman game. Got time to waste, then waste it getting lost in this insanely huge pacman game. Click here to go the website to play. Thus sounds like the greatest Pacman related invention since the Pacroid came into existance. Yup, eat all the dots in level 1 and you get my respect, without it. You are dirt between my toes...you don't want to be tasty toe dirt, do you? Whoa... and I thought I had too much time on my hands! 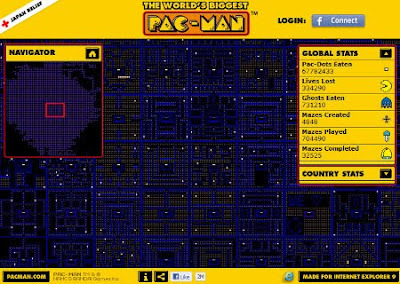 Pacman, the great time waster?! *blink* *blink*, I'll pass, lol.